The Economic Outlook Cameron Bagrie Chief Economist September 2012. 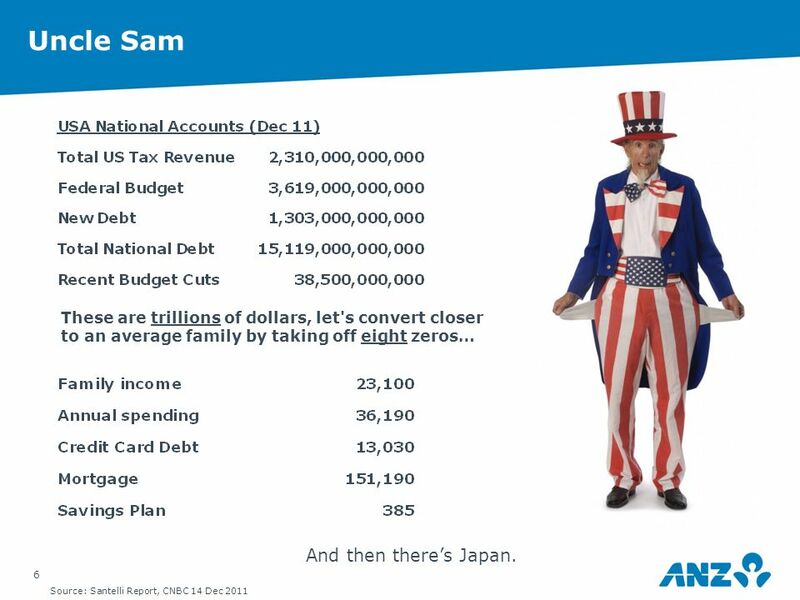 7 6 Uncle Sam These are trillions of dollars, let's convert closer to an average family by taking off eight zeros… Source: Santelli Report, CNBC 14 Dec 2011 And then theres Japan. 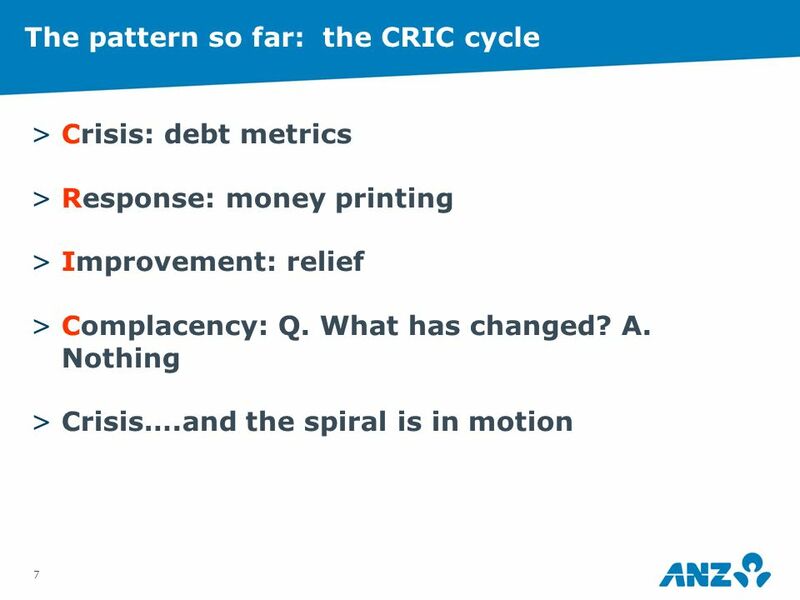 16 15 A cyclical correction and currency challenges…..
23 22 Improvements, but still expensive OCR cuts? OCR hikes? 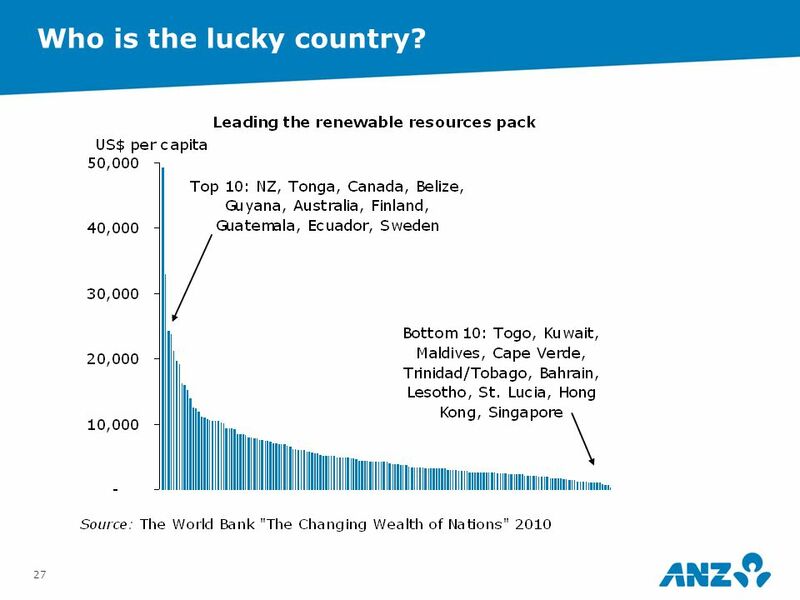 28 27 Who is the lucky country? 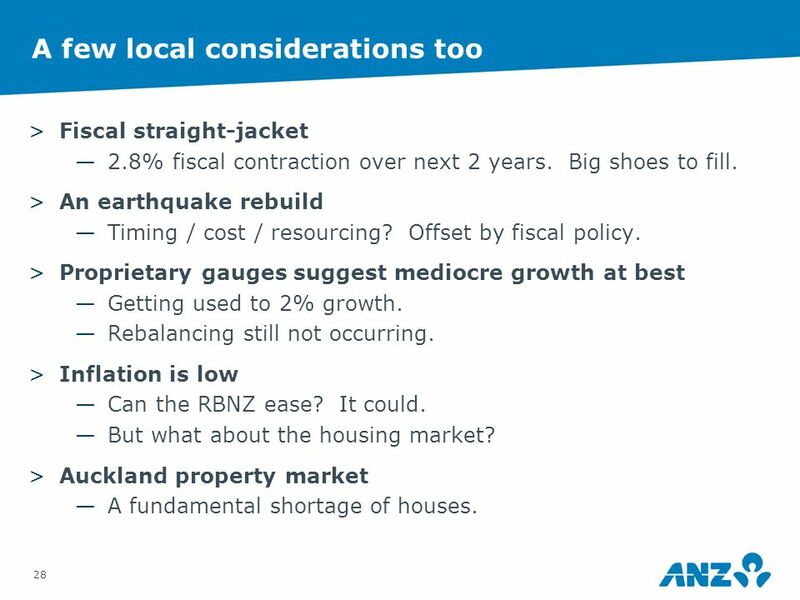 29 28 A few local considerations too >Fiscal straight-jacket 2.8% fiscal contraction over next 2 years. Big shoes to fill. >An earthquake rebuild Timing / cost / resourcing? 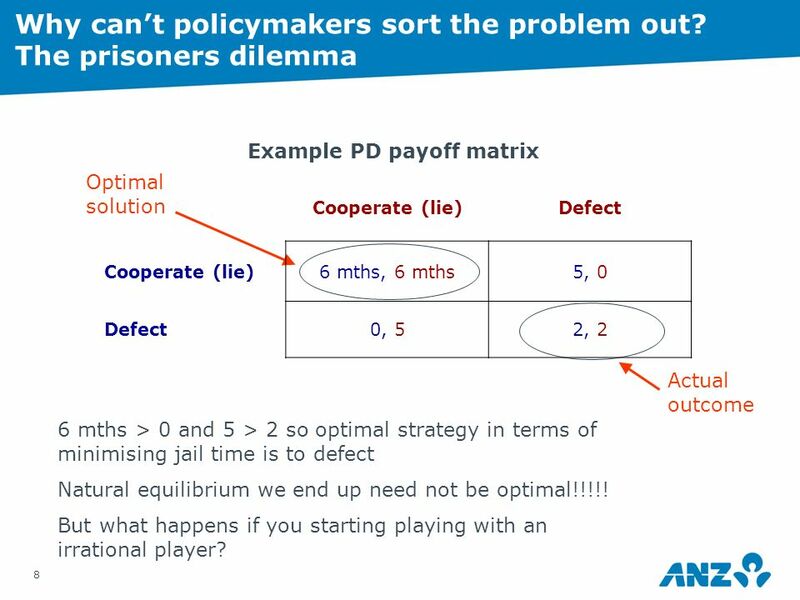 Offset by fiscal policy. >Proprietary gauges suggest mediocre growth at best Getting used to 2% growth. 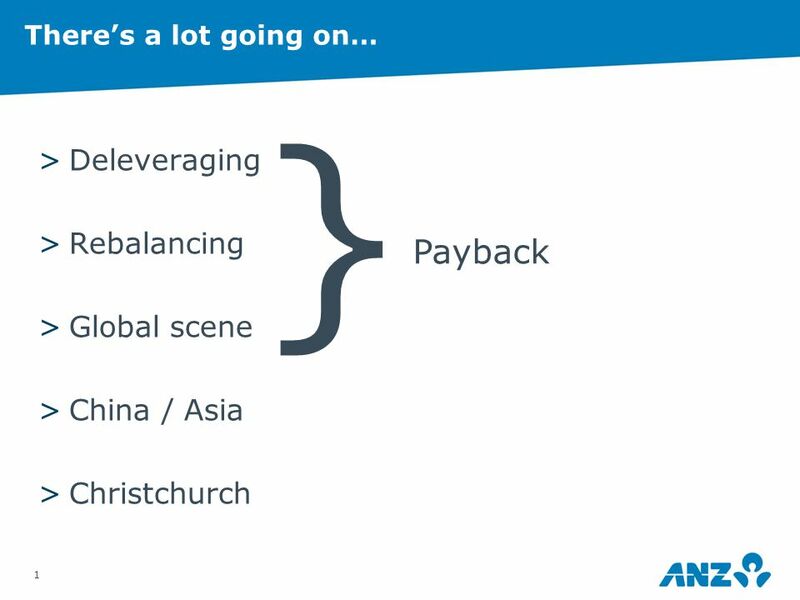 Rebalancing still not occurring. 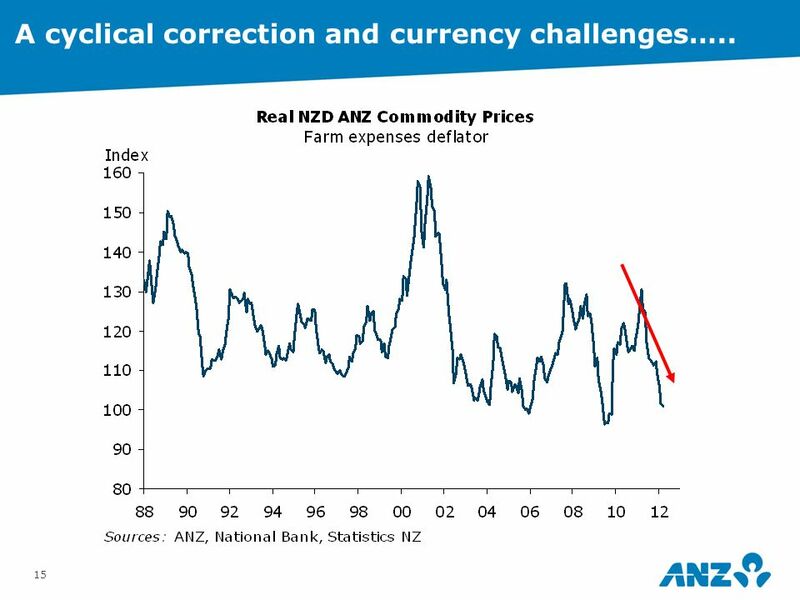 >Inflation is low Can the RBNZ ease? It could. But what about the housing market? >Auckland property market A fundamental shortage of houses. 31 30 All up… >OCR hike off the agenda. Cuts cant be ruled out. >NZD unlikely to be as weak as wed like. 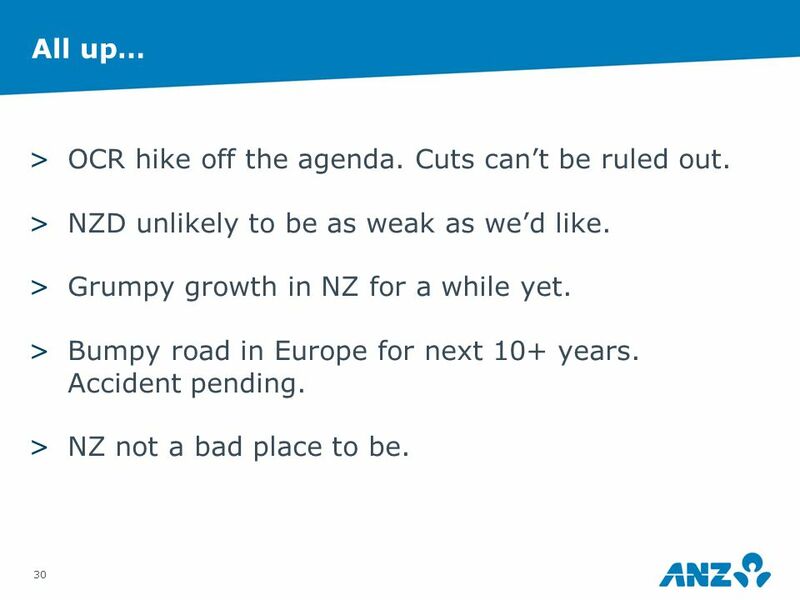 >Grumpy growth in NZ for a while yet. 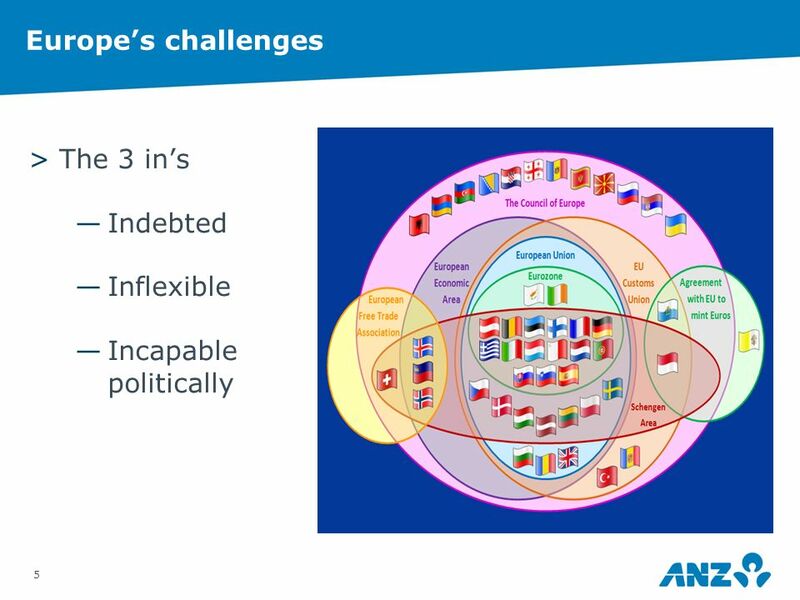 >Bumpy road in Europe for next 10+ years. Accident pending. >NZ not a bad place to be. 32 31 Disclaimer IMPORTANT NOTICE: The distribution of this document or streaming of this video broadcast (as applicable, publication) may be restricted by law in certain jurisdictions. Persons who receive this publication must inform themselves about and observe all relevant restrictions. COUNTRY/REGION SPECIFIC INFORMATION: AUSTRALIA. This publication is distributed in Australia by Australia and New Zealand Banking Group Limited (ABN 11 005 357 522) (ANZ). ANZ holds an Australian Financial Services licence no. 234527. 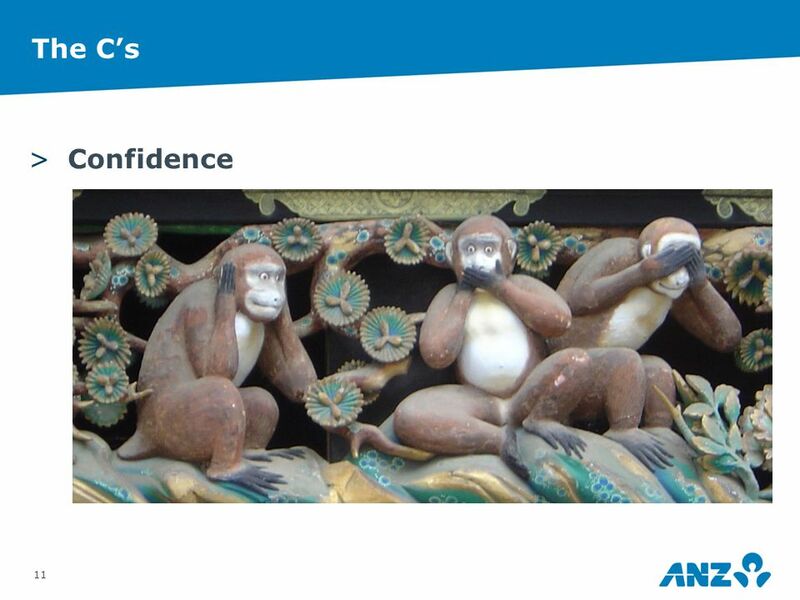 A copy of ANZ's Financial Services Guide is available at http://www.anz.com/documents/AU/aboutANZ/FinancialServicesGuide.pdf and is available upon request from your ANZ point of contact. If trading strategies or recommendations are included in this publication, they are solely for the information of wholesale clients (as defined in section 761G of the Corporations Act 2001 Cth). Persons who receive this publication must inform themselves about and observe all relevant restrictions. BRAZIL. 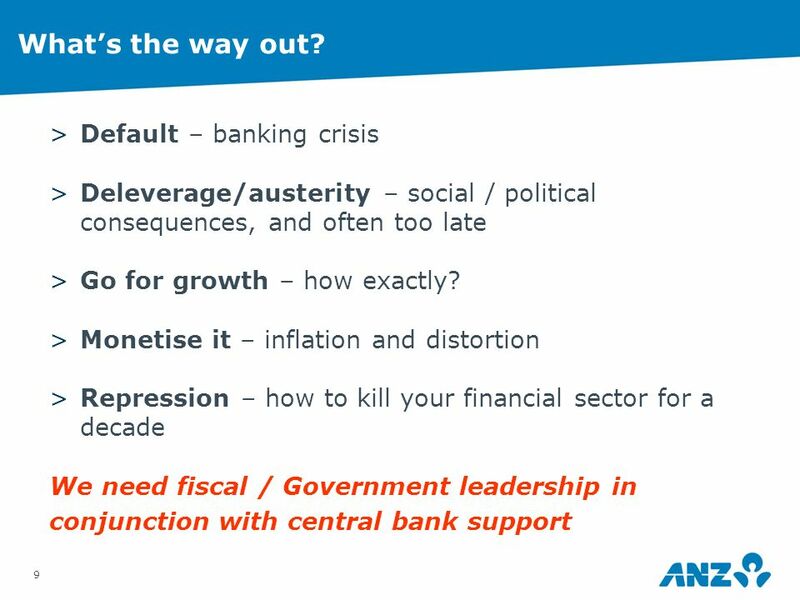 This publication is distributed in Brazil by ANZ only for the information of the Central Bank of Brazil. No securities are being offered or sold in Brazil under this publication, and no securities have been and will not be registered with the Securities Commission - CVM. BRUNEI. JAPAN. KUWAIT. MALAYSIA. SWITZERLAND. TAIPEI. This publication is distributed in each of Brunei, Japan, Kuwait, Malaysia, Switzerland and Taipei by ANZ on a cross- border basis. EUROPEAN ECONOMIC AREA (EEA): UNITED KINGDOM. ANZ is authorised and regulated in the United Kingdom by the Financial Services Authority (FSA). This publication is distributed in the United Kingdom by ANZ solely for the information of persons who would come within the FSA definition of eligible counterparty or professional client. It is not intended for and must not be distributed to any person who would come within the FSA definition of retail client. Nothing here excludes or restricts any duty or liability to a customer which ANZ may have under the UK Financial Services and Markets Act 2000 or under the regulatory system as defined in the Rules of the FSA. GERMANY. This publication is distributed in Germany by the Frankfurt Branch of ANZ solely for the information of its clients. Other EEA countries. This publication is distributed in the EEA by ANZ Bank (Europe) Limited (ANZBEL) which is authorised and regulated by the FSA in the United Kingdom, to persons who would come within the FSA definition of eligible counterparty or professional client in other countries in the EEA. This publication is distributed in those countries solely for the information of such persons upon their request. It is not intended for, and must not be distributed to, any person in those countries who would come within the FSA definition of retail client. FIJI. For Fiji regulatory purposes, this publication and any views and recommendations are not to be deemed as investment advice. Fiji investors must seek licensed professional advice should they wish to make any investment in relation to this publication. HONG KONG. 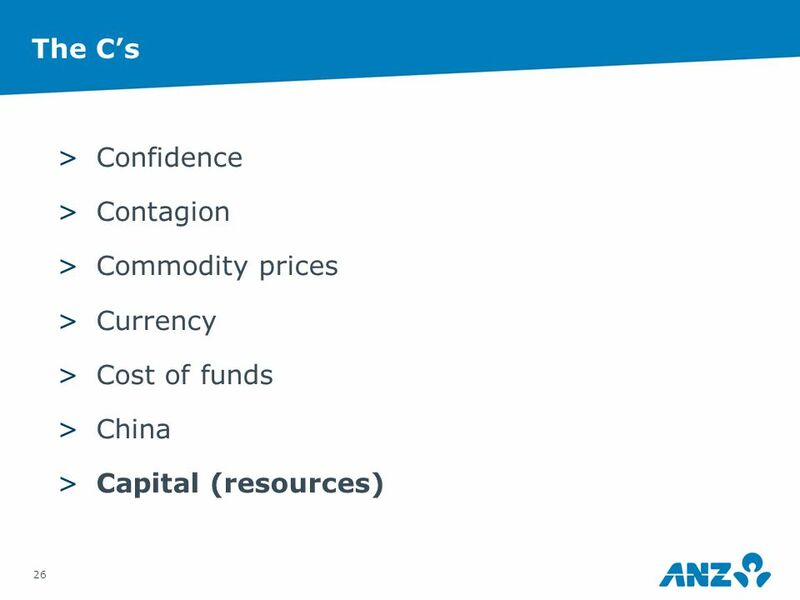 This publication is distributed in Hong Kong by the Hong Kong branch of ANZ, which is registered by the Hong Kong Securities and Futures Commission to conduct Type 1 (dealing in securities), Type 4 (advising on securities) and Type 6 (advising on corporate finance) regulated activities. The contents of this publication have not been reviewed by any regulatory authority in Hong Kong. If in doubt about the contents of this publication, you should obtain independent professional advice. INDIA. 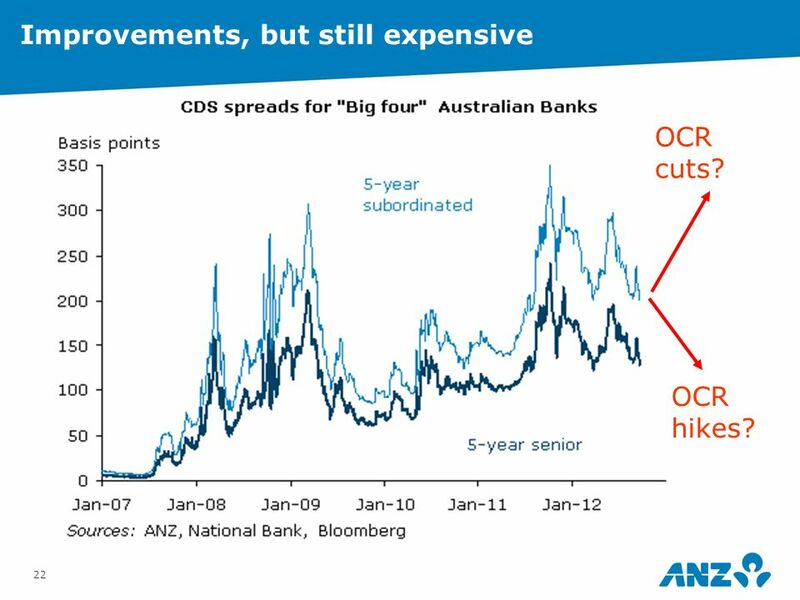 This publication is distributed in India by ANZ on a cross-border basis. If this publication is received in India, only you (the specified recipient) may print it provided that before doing so, you specify on it your name and place of printing. Further copying or duplication of this publication is strictly prohibited. NEW ZEALAND. This document is intended to be of a general nature, does not take into account your financial situation or goals, and is not a personalised adviser service under the Financial Advisers Act 2008. PEOPLES REPUBLIC OF CHINA. 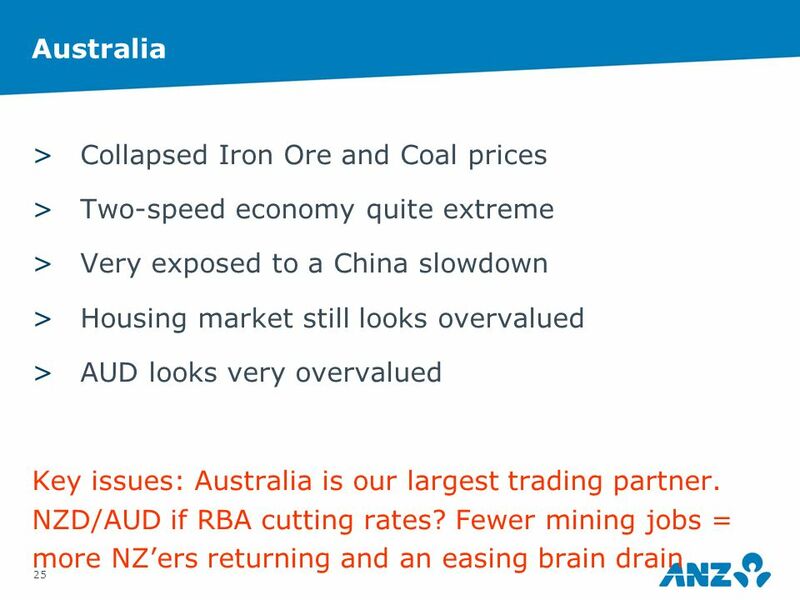 If and when the material accompanying this publication does not only relate to the products and/or services of Australia and New Zealand Bank (China) Company Limited (ANZ China), it is noted that: This publication is distributed by ANZ or an affiliate. 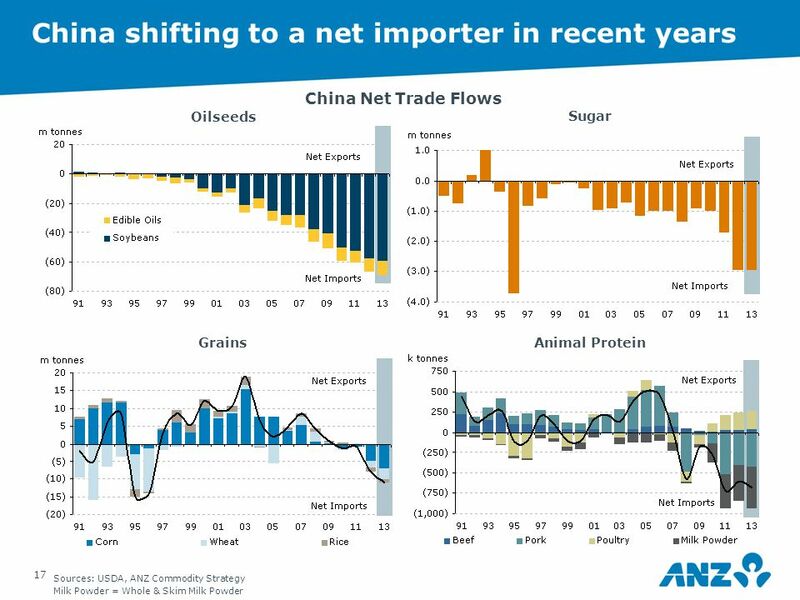 No action has been taken by ANZ or any affiliate which would permit a public offering of any products or services of such an entity or distribution or re-distribution of this publication in the Peoples Republic of China (PRC). Accordingly, the products and services of such entities are not being offered or sold within the PRC by means of this publication or any other method. This publication may not be distributed, re-distributed or published in the PRC, except under circumstances that will result in compliance with any applicable laws and regulations. 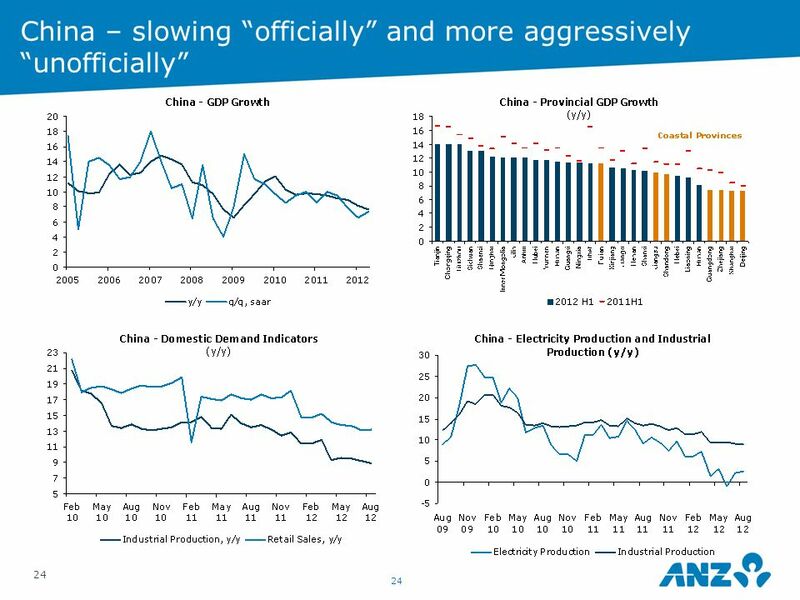 If and when the material accompanying this publication relates to the products and/or services of ANZ China only, it is noted that: This publication is distributed by ANZ China in the Mainland of the PRC. SINGAPORE. 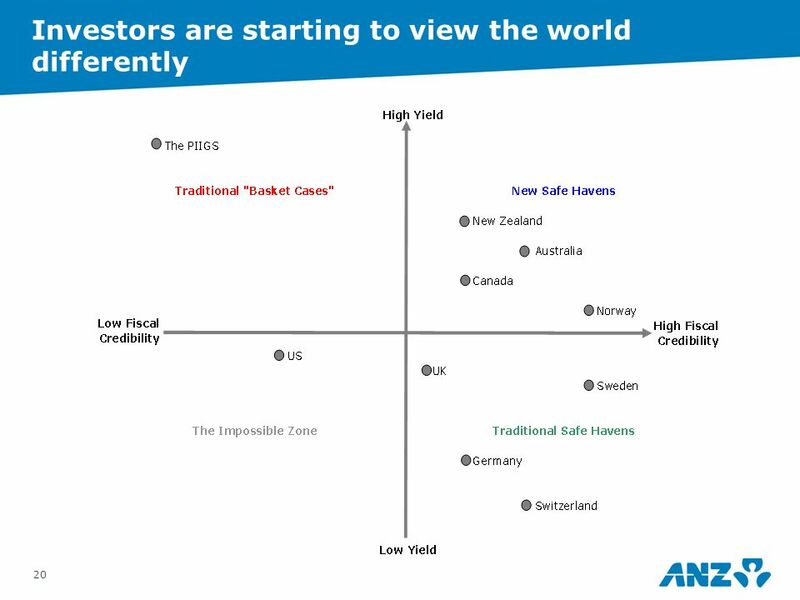 This publication is distributed in Singapore by the Singapore branch of ANZ solely for the information of accredited investors, expert investors or (as the case may be) institutional investors (each term as defined in the Securities and Futures Act Cap. 289 of Singapore). 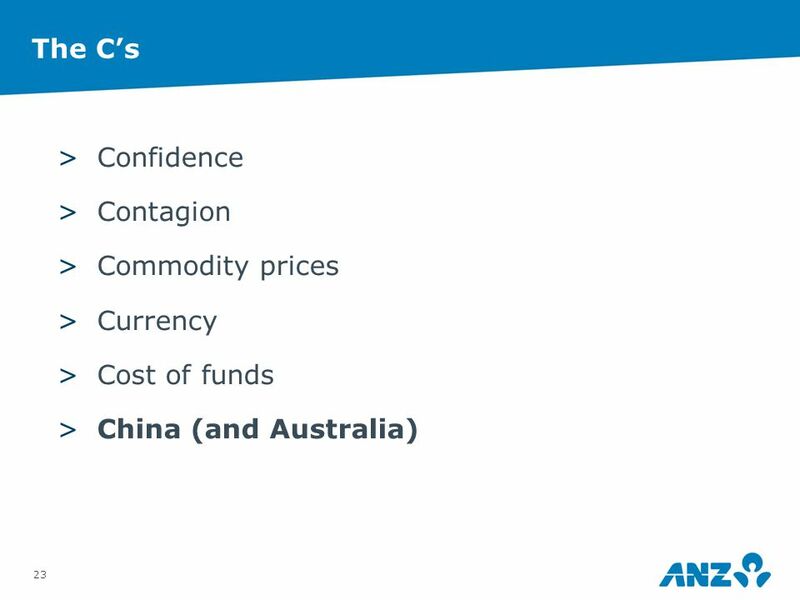 ANZ is licensed in Singapore under the Banking Act Cap. 19 of Singapore and is exempted from holding a financial advisers licence under Section 23(1)(a) of the Financial Advisers Act Cap. 100 of Singapore. In respect of any matters arising from, or in connection with the distribution of this publication in Singapore, contact your ANZ point of contact. UNITED ARAB EMIRATES. This publication is distributed in the United Arab Emirates (UAE) or the Dubai International Financial Centre (as applicable) by ANZ. This publication: does not, and is not intended to constitute an offer of securities anywhere in the UAE; does not constitute, and is not intended to constitute the carrying on or engagement in banking, financial and/or investment consultation business in the UAE under the rules and regulations made by the Central Bank of the United Arab Emirates, the Emirates Securities and Commodities Authority or the United Arab Emirates Ministry of Economy; does not, and is not intended to constitute an offer of securities within the meaning of the Dubai International Financial Centre Markets Law No. 12 of 2004; and, does not constitute, and is not intended to constitute, a financial promotion, as defined under the Dubai International Financial Centre Regulatory Law No. 1 of 200. ANZ DIFC Branch is regulated by the Dubai Financial Services Authority (DFSA). The financial products or services described in this publication are only available to persons who qualify as Professional Clients or Market Counterparty in accordance with the provisions of the DFSA rules. 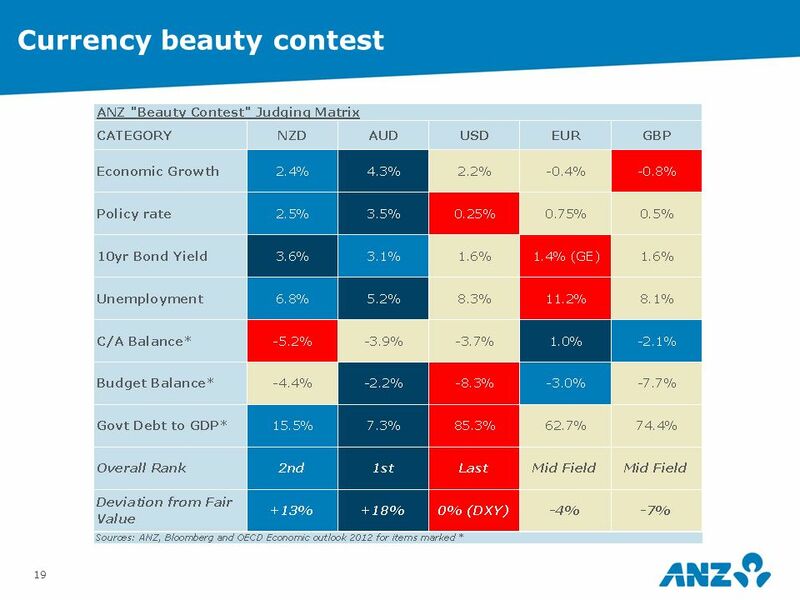 In addition, ANZ has a representative office (ANZ Representative Office) in Abu Dhabi regulated by the Central Bank of the United Arab Emirates. ANZ Representative Office is not permitted by the Central Bank of the United Arab Emirates to provide any banking services to clients in the UAE. 33 32 Disclaimer UNITED STATES. If and when this publication is received by any person in the United States or a "U.S. person" (as defined in Regulation S under the US Securities Act of 1933, as amended) (US Person) or any person acting for the account or benefit of a US Person, it is noted that: ANZ Securities, Inc. (ANZ S) is a member of FINRA (www.finra.org) and registered with the SEC. Also, ANZ Ss address is 277 Park Avenue, 31st Floor, New York, NY 10172, United States of America (Tel: +1 212 801 9160 Fax: +1 212 801 9163). This publication is distributed in the United States by ANZ S (a wholly owned subsidiary of ANZ, which accepts responsibility for its content. 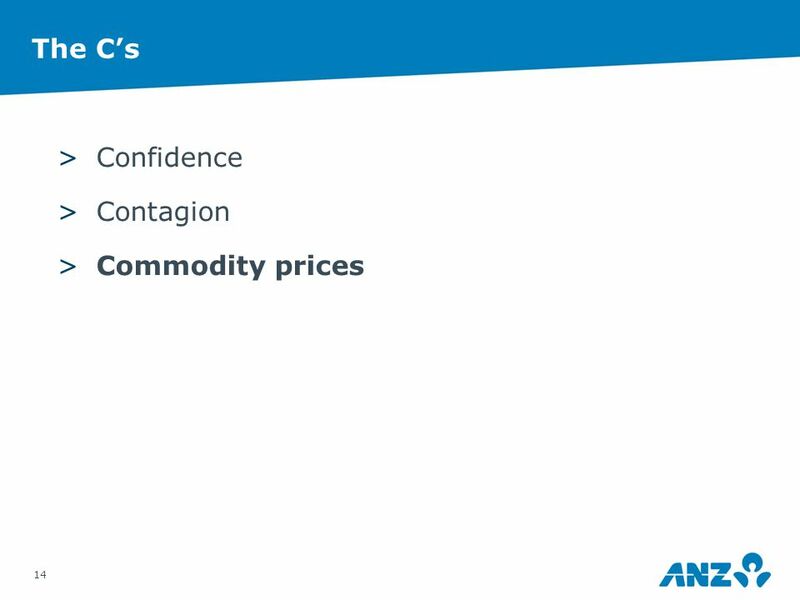 Information on any securities referred to in this publication may be obtained from ANZ S upon request. 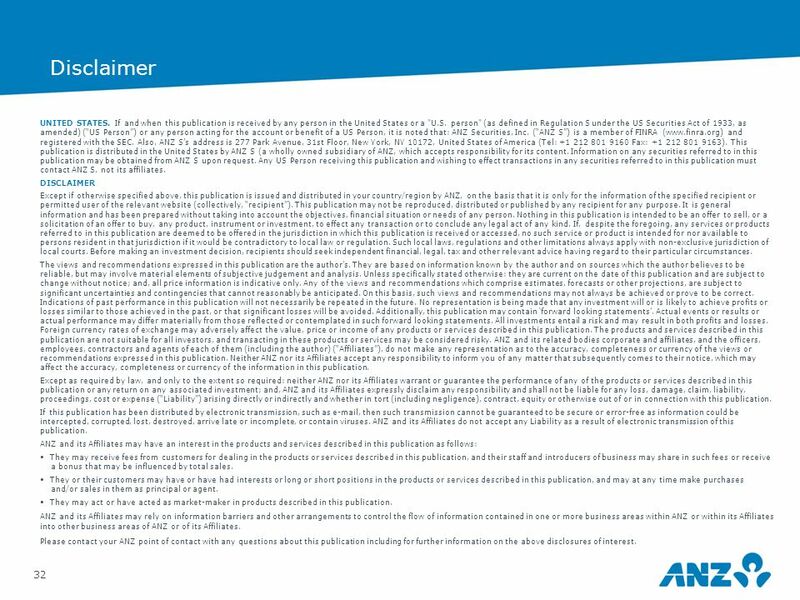 Any US Person receiving this publication and wishing to effect transactions in any securities referred to in this publication must contact ANZ S, not its affiliates. 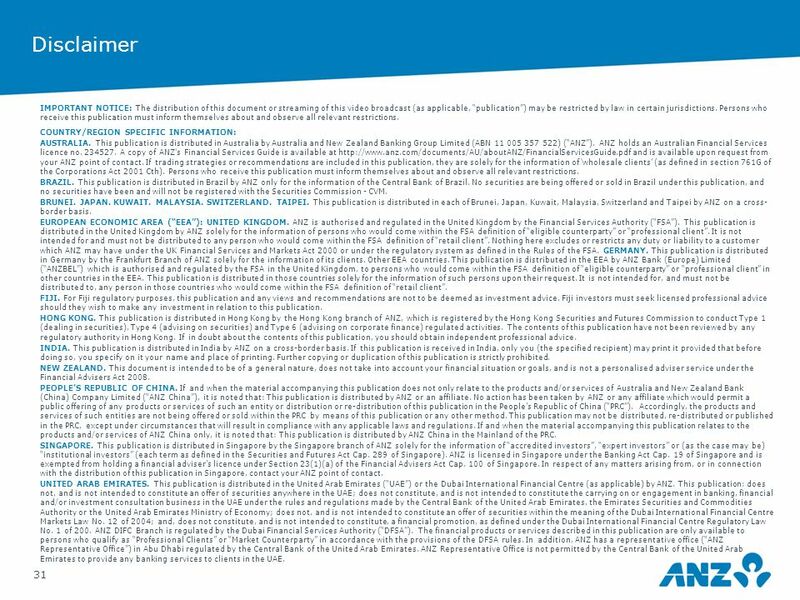 DISCLAIMER Except if otherwise specified above, this publication is issued and distributed in your country/region by ANZ, on the basis that it is only for the information of the specified recipient or permitted user of the relevant website (collectively, recipient). This publication may not be reproduced, distributed or published by any recipient for any purpose. It is general information and has been prepared without taking into account the objectives, financial situation or needs of any person. Nothing in this publication is intended to be an offer to sell, or a solicitation of an offer to buy, any product, instrument or investment, to effect any transaction or to conclude any legal act of any kind. If, despite the foregoing, any services or products referred to in this publication are deemed to be offered in the jurisdiction in which this publication is received or accessed, no such service or product is intended for nor available to persons resident in that jurisdiction if it would be contradictory to local law or regulation. Such local laws, regulations and other limitations always apply with non-exclusive jurisdiction of local courts. Before making an investment decision, recipients should seek independent financial, legal, tax and other relevant advice having regard to their particular circumstances. The views and recommendations expressed in this publication are the authors. They are based on information known by the author and on sources which the author believes to be reliable, but may involve material elements of subjective judgement and analysis. Unless specifically stated otherwise: they are current on the date of this publication and are subject to change without notice; and, all price information is indicative only. Any of the views and recommendations which comprise estimates, forecasts or other projections, are subject to significant uncertainties and contingencies that cannot reasonably be anticipated. On this basis, such views and recommendations may not always be achieved or prove to be correct. Indications of past performance in this publication will not necessarily be repeated in the future. No representation is being made that any investment will or is likely to achieve profits or losses similar to those achieved in the past, or that significant losses will be avoided. Additionally, this publication may contain forward looking statements. Actual events or results or actual performance may differ materially from those reflected or contemplated in such forward looking statements. All investments entail a risk and may result in both profits and losses. Foreign currency rates of exchange may adversely affect the value, price or income of any products or services described in this publication. The products and services described in this publication are not suitable for all investors, and transacting in these products or services may be considered risky. 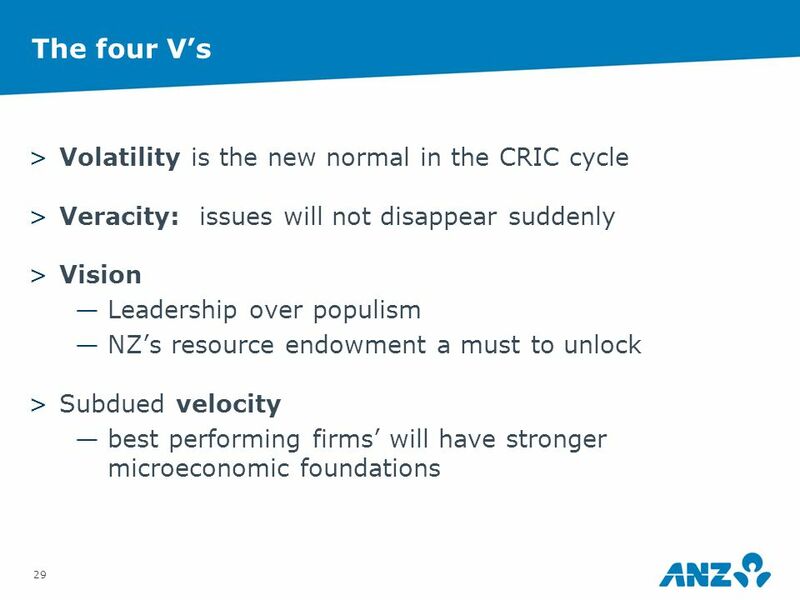 ANZ and its related bodies corporate and affiliates, and the officers, employees, contractors and agents of each of them (including the author) (Affiliates), do not make any representation as to the accuracy, completeness or currency of the views or recommendations expressed in this publication. 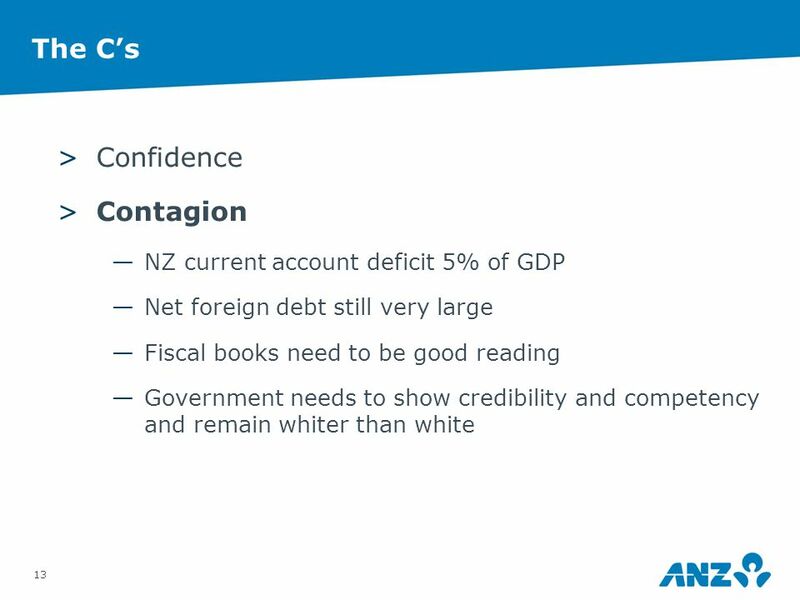 Neither ANZ nor its Affiliates accept any responsibility to inform you of any matter that subsequently comes to their notice, which may affect the accuracy, completeness or currency of the information in this publication. Except as required by law, and only to the extent so required: neither ANZ nor its Affiliates warrant or guarantee the performance of any of the products or services described in this publication or any return on any associated investment; and, ANZ and its Affiliates expressly disclaim any responsibility and shall not be liable for any loss, damage, claim, liability, proceedings, cost or expense (Liability) arising directly or indirectly and whether in tort (including negligence), contract, equity or otherwise out of or in connection with this publication. If this publication has been distributed by electronic transmission, such as e-mail, then such transmission cannot be guaranteed to be secure or error-free as information could be intercepted, corrupted, lost, destroyed, arrive late or incomplete, or contain viruses. ANZ and its Affiliates do not accept any Liability as a result of electronic transmission of this publication. 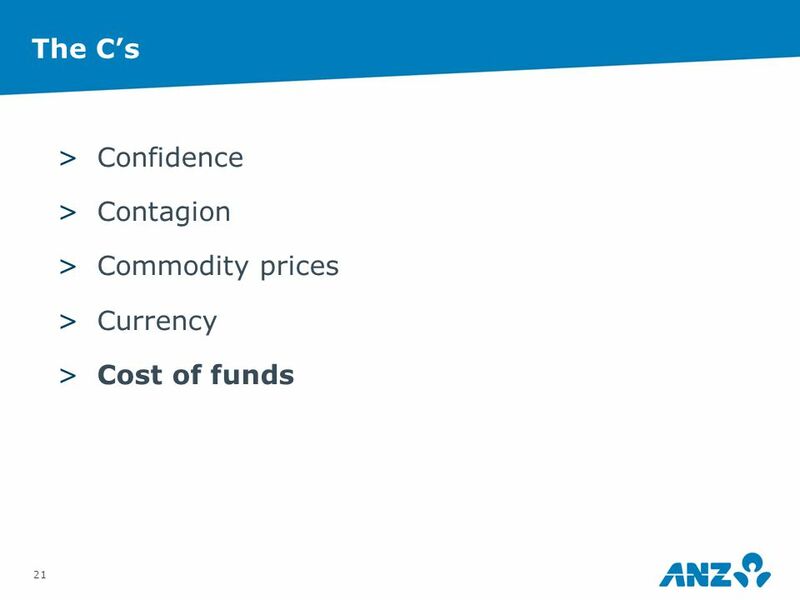 ANZ and its Affiliates may have an interest in the products and services described in this publication as follows: They may receive fees from customers for dealing in the products or services described in this publication, and their staff and introducers of business may share in such fees or receive a bonus that may be influenced by total sales. They or their customers may have or have had interests or long or short positions in the products or services described in this publication, and may at any time make purchases and/or sales in them as principal or agent. They may act or have acted as market-maker in products described in this publication. 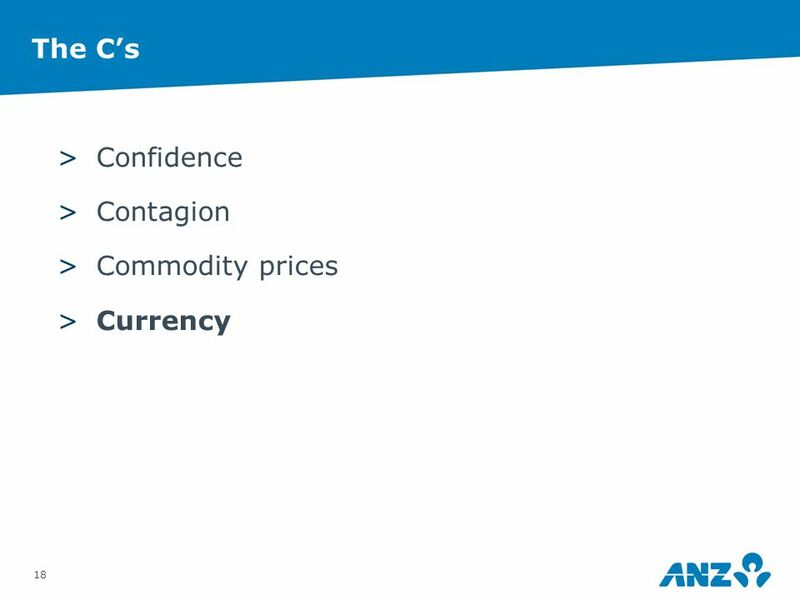 ANZ and its Affiliates may rely on information barriers and other arrangements to control the flow of information contained in one or more business areas within ANZ or within its Affiliates into other business areas of ANZ or of its Affiliates. Please contact your ANZ point of contact with any questions about this publication including for further information on the above disclosures of interest. 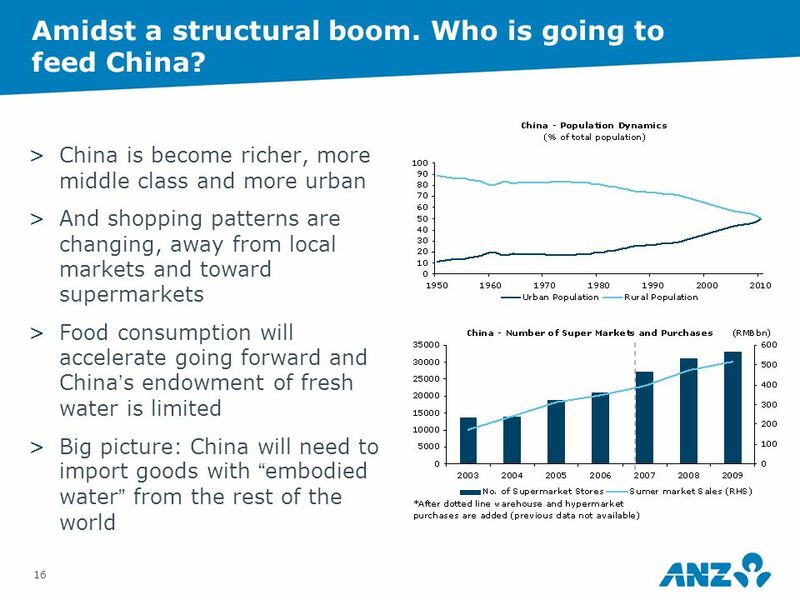 Download ppt "The Economic Outlook Cameron Bagrie Chief Economist September 2012." 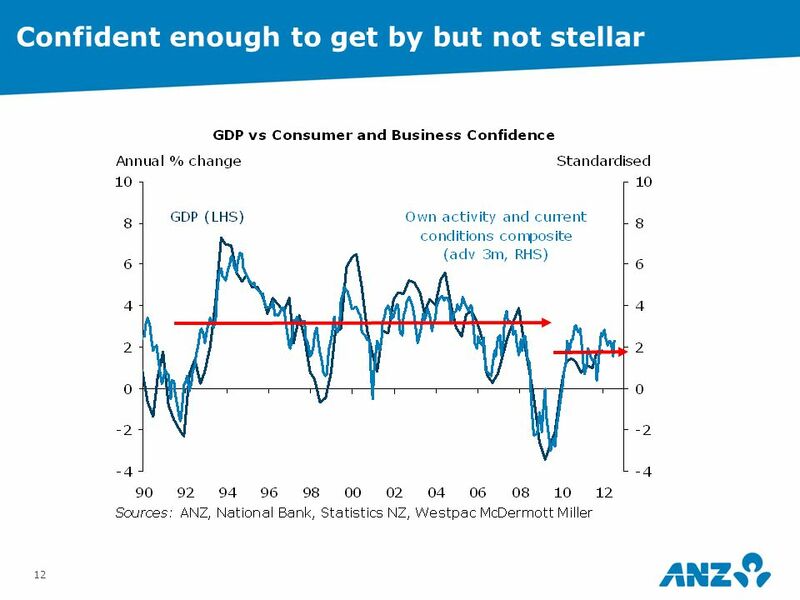 The New Zealand Economy: Fork in the Road August 2013 Dominick Stephens Chief Economist. CLIENT INVESTMENT UPDATE Wholesale Products Appendix 30 September 2014. PIC Investments Performance Update Year ended 30 September 2014 APPENDIX Advisor Use Only. Silver linings in dark clouds James McCann RBS Group Economics May 2013. Investment Strategy Perspective The Post Election Outlook Hope and Change or More of the Same? November 2012. State of Play: Economic update for the tourism industry November 2014 Dominick Stephens Chief Economist.